It is essential to maintain a healthy level of cholesterol as that in turn affects our health. However, not all cholesterol is bad. There is good cholesterol (HDL), which keeps away the LDL and there is bad cholesterol (LDL), which can be a cause of heart attacks, or strokes. 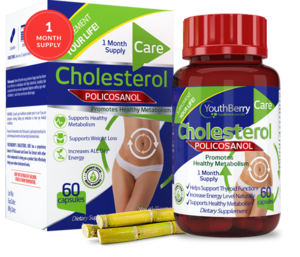 At YouthBerry; we have formulated a naturally potent formula to keep a check on your bad cholesterol levels, while increasing your HDL levels. The cholesterol found in animals increases blood cholesterol and leads to the development of atherosclerosis and heart disease. Whereas, Phytosterols, also known as plant sterols, are cholesterol-like molecules found in plants such as whole grains, fruits, legumes (for example, lentils and soybeans), and other vegetables. They are minimally absorbed from the small intestine, so they do not enter the bloodstream. 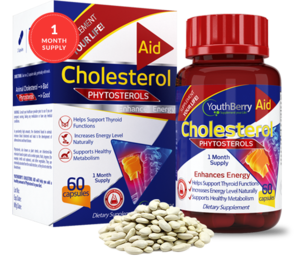 YouthBerry’s Cholesterol Aid will help you add a healthy amount of Phytosterols to your diet. Cholesterol Aid is also known to support a healthy metabolism, support thyroid functions and naturally increase energy levels. YouthBerry’s Cholesterol Care has a proprietary blend of Policosanol and Green Tea Extract with other vital compounds to bring you a product that effectively helps you reduce cholesterol levels. Policosanol, derived from the waxy portion of sugar cane has shown to be effective in individuals with high cholesterol, including that associated with non-insulin- dependent diabetes mellitus (age-related diabetes) - and it does not increase blood sugar. Additionally, the Cholesterol Care supplements support a healthy metabolism, support weight loss and increase energy throughout the day. High blood cholesterol is a condition in which you have too much cholesterol in your blood. By itself, the condition usually has no signs or symptoms. Thus, many people don’t know that their cholesterol levels are too high. However, people who have high blood cholesterol have a greater chance of getting coronary heart disease, also called coronary artery disease. The higher the level of LDL cholesterol in your blood, the greater your chance is of getting heart disease. 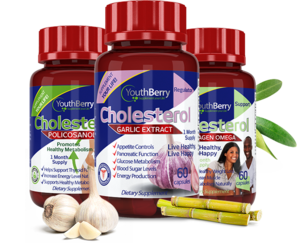 YouthBerry’s Cholesterol Regulator with Garlic Extract will help you reduce the “bad” cholesterol and increase the “good” cholesterol.